Grant Erp, Secretary/Treasurer 021 705 458. Our shed is located at 42 The Centre, WAIPU. 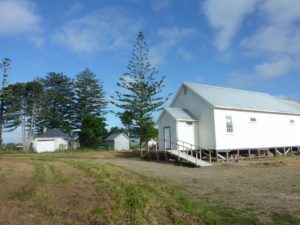 It is the old Community Hall which is now part of the WAIPU Heritage Precinct which is under control of the WAIPU Museum. It was built in the 1870’s and it was moved by community members onto its present site in March 2015 using 100 year old jacks, a sled and a D8 bulldozer. It was the third move for the building which was previously moved by bullock teams. Our Shed was incorporated in October 2016. It is open on Tuesdays 9am to 12pm and other days as and when needed. We have been very active doing community projects including bench seats, stage props, a modular stage, rat traps, stoat traps, penguin nesting boxes and repairs to local heritage buildings. Members also undertake their own projects.